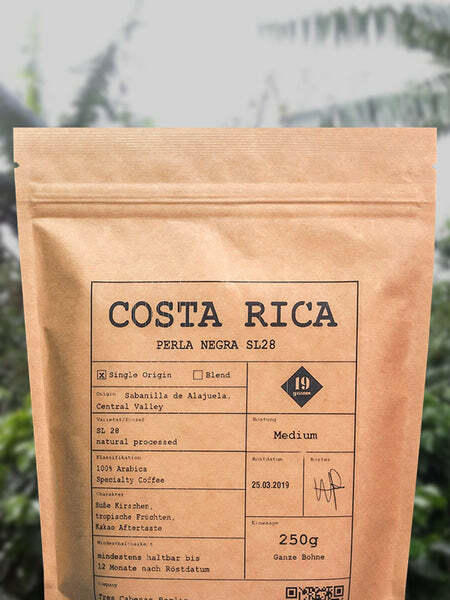 The company ranges from directly sourced blends for supermarket consumers as well as higher grade speciality coffees including Esmeralda Geisha for their specialty cafes spread around the city. Since the beginning they have always maintained a strong focus on allowing all consumers to experience a varying degree of coffee from different origins, varietals and roasts with quality and sustainable sourcing being integral to their range. The owners of the company, Robert Stock and Sascha Spittel have close ties with the Sonora Farm in Costa Rica where they regularly visit, purchasing a number of different varieties and processes each harvest. Over the last 8 years the company have shown great support to Sonoras 100% self sustaining finca, encouraging their development in quality through a donation of a sample roaster and the sharing of information improving cup quality year on year. The company is also apart of the Cup Of Excellence and Sascha has been apart of the judging in El Salvador, Rwanda and Costa Rica, buying COE coffees regularly. In 2013 Tres Cabezas opened their first 19 Grams cafe located on Schlesische Strasse, Kreuzberg. This hole in the wall cafe has since become a popular destination for the local offices and neighbours as well as the tourists on their way to visit the Eastside Gallery, and Oberbaumbrucke. They serve locally roasted Tres Cabezas house blend ‘Wild At Heart’ as well as a single origin espresso and filter coffee that change monthly. The cafe has a friendly vibe and the staff are always up for a good yarn with a strong focus on brewing good coffee alongside excellent customer service, a quality often forgotten in many other cafes around the city. In 2016 Tres opened their second 19 Grams cafe located on Chaussee Strasse, Mitte. Once again, with great energy and friendly service this cafe has become a meeting point for the locals and a destination for others, serving Aussie style brunch, the ‘Wild At Heart’ blend alongside monthly changing espresso and filter coffees and homemade cakes. As opposed to 19 Grams Schlesi that is predominantly a take out cafe, Chaussee is a beautiful 3 level café with a big sunny terrace. Next year, in 2018 Tres Cabezas will be moving its Roastery from Friedrichshain to the heart of the city under Alexander Platz. This location will feature not only the roastery, but also a training space, a La Marzocco showroom, and their 3rd 19 Grams cafe. With tonnes of seating inside and a beer garden outside, it will be a place for real coffee enthusiasts to enjoy a coffee alongside the space in which it is roasted as well as being amongst a La Marzocco showroom and training space. As the company has expanded over the last decade and a half so has their team. Building a family orientated crew with a focus on the growth and support of each and every member, this symbiotic relationship has enabled both the company and its employees to progress in all facets of the specialty coffee industry.